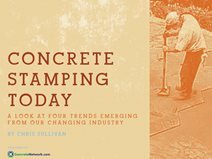 Concrete Network has teamed up with technical expert Chris Sullivan to produce a series of e-books on popular decorative concrete applications. Through interviews and case studies, these e-books seek to present a state of the industry. 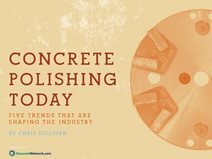 Must-reads for decorative concrete contractors, the books introduce important market trends and provide strategies for staying profitable. Get behind-the-scenes information and valuable insights from veteran stampers on how to be successful in an increasingly competitive industry. Discover specialty customization techniques, popular stamping tools, commonly requested finishing practices and creative ways to stay profitable. 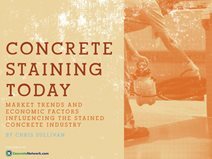 Packed with the experiences of skilled installers from around the country, this e-book takes an in-depth look at market trends and economic factors that are currently influencing the stained concrete industry. Learn about new staining products, expanded color palettes, increased installer competition, new markets for stained concrete and popular sealer types. 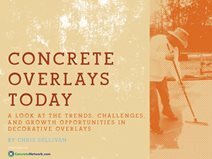 Packed with the insights of veteran overlay installers from around the country, Concrete Overlays Today will help decorative concrete contractors gain insight into an evolving industry. Filled with the experiences and advice of veteran polishers from across the country, Concrete Polishing Today will help contractors gain insight into a complex and changing industry.